The fabric selected for this project was a group effort. We decided to use laminated cotton for the shower cap eliminating the super thin vinyl and taking a step out of the shower cap construction. 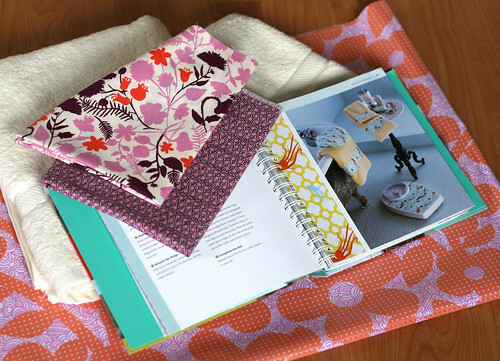 The laminated cotton selected is Erin McMorris Weekends Dots and Loops Peach. The fabric for the towels is Liz Scott Sugar Pop Painted Flowers Cream Pink and Dots Dot Dot Dot Eggplant. 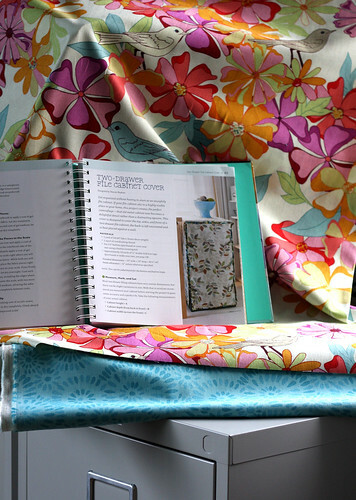 Tracy selected Valori Wells – Jenaveve Linen Floral Birds Garden Fresh. Tracy decided to make her own bias tape from Valori Wells – Jenaveve Linen Pebbles Teal. It required an extra 3/4 yard of fabric to create 10 yards of bias binding. For this project you will need 6 fabric covered buttons or select 6 fun buttons 1-1/2″ in size.